Here is a very healthy and easy to make beetroot salad recipe. This beetroot salad is very easy. Boil several beetroots in salty water. They have to get cooked well. You can prick them with a fork to see, if they got cooked. Then you cool them, peel them and grate the beetroots. Take few cloves of garlic and grate or press them into the salad. Pour some plant oil (I use sunflower plant oil) into your salad. This beetroot salad is very healthy. 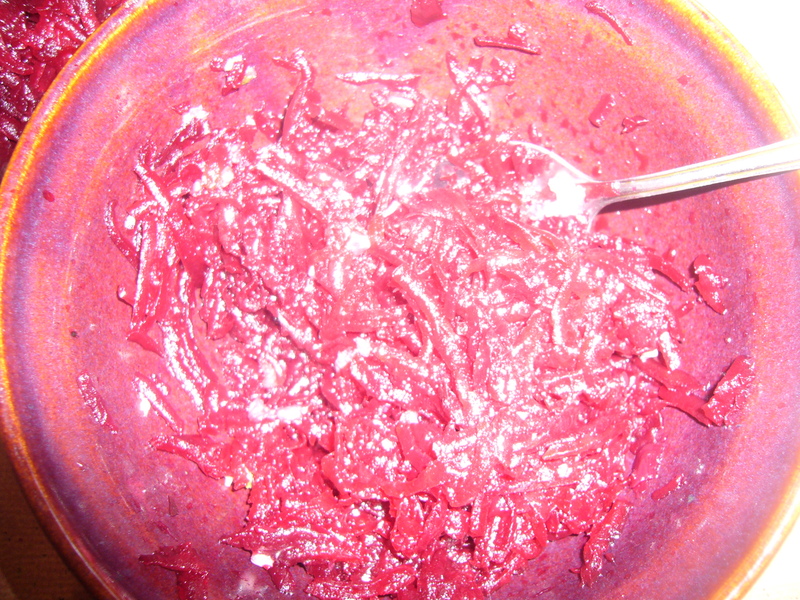 The beetroot contains many vitamins, essential for your health. Garlic helps to clean your vessels and boosts your immune system. Plant oil contains vitamins and antioxidants in it. This entry was posted in Easy Recipes and tagged beetroot, beetroot salad, breakfast recipe, busy moms, cooking, cooking tips, easy beetroot salad recipe, easy recipe, easy salad recipe, food, health, healthy food, healthy salad recipe, quick recipe, quick snack for kids, salad recipe, tips for moms, vegan salad. Bookmark the permalink.